Have you ever have the experience of sleeping with someone that snores loudly in their sleep? It’s truly annoying especially when you are died tired and try to catch some sleep. My partner snores, very loudly so as my kids. It’s so irritating that sometimes I have to go to another room to sleep. I read about snoring relief pillows and wonder how effective it is. Really tempted to get one to try. I saw promotion of snoring pillows from cityofsleep.com. Going to get one to try it out. During one of our casual chat, JS was mentioning about her future study plan. What she wants to study after finish high school. She was asking if she can do a double degree as in Art and Music. Like any other teens, she is really into music now. All the latest hits. She wants to learn DJ-ing, learning how to use all the gadget like kaoss pad 3 plus at musicians friend. I remembered when I was her age, I too dream of becoming a DJ where I can play all my favourite songs and meeting up with celebrities. Let see if 6 years down the road, she still has the same ambition. The kids love to sing and they can come up with all sort of parody. 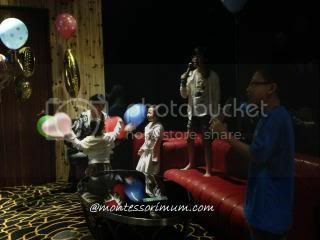 This is a recent photo taken at the karaoke session to celebrate SIL’s birthday. We don’t have a karaoke system at home. If only we could have one and top up with a acoustic amplifier at Musicians Friend , I guess they will be so distracted from their studies and want to sing all day long at home. During my primary school years back in my hometown, there’s a school band in our school. A few other schools including secondary school also has school bands. Besides performing during school events like sports day, children’s day , the band also perform during funeral. yes, you got it me, the school bands consisting of primary school kids perform during funeral. Our school situated right in the center of town and when these rich local businessman pass away, they donate money to the school and as a favour, the band perform during the funeral possession, marching along the street to the funeral parlor donning full band uniforms. Those were the memories. Since we moved to the city, I am not aware of many schools having their own school bands. The two older kids were very lucky to be able go to Linkin Park concert at Bukit Jalil with their dad last Monday. They had a blast. In fact WH is the shortest and youngest fan there. I think there’s a age restriction to be at the concert, daddy was so prepared to get the kids lie on their age, but somehow they manage to get in. Kids had a blast. It’s their first rock concert.